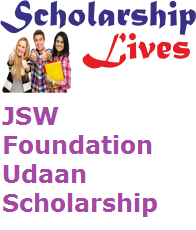 JSW Foundation Udaan Scholarship has recently activated JSW Foundation Udaan Scholarship 2019 for ITI, UG, PG, B.Ed, Diploma Students at the official website of the department. If you are also one of the eligible candidates then check here complete eligibility criteria, selection mode and how to apply online and fill JSW Scholarship Online Application form 2019 before the last date which is mention below. Education Required: Minimum 50% in Class 10, Minimum 50% in Class 12, Minimum 50% in Diploma.